While gallivanting across the galaxy to do things like collect datacrons on alts, I thought I might as well kill two birds with one stone and get some map exploration done at the same time (and get the Galactic Explorer achievement in the process). Surprisingly, this turned out to be more challenging than I expected. The way SWTOR reveals maps to you as you explore is a bit weird. When you first enter an area, the map is covered in dark hexes that light up as you explore designated sub-zones of the region. However, not every hex is actually connected to a sub-zone. What this means is that you end up with little dark spots all over your map that make you think that there is something left for you to uncover in that place, when actually there isn't. They go away once you've found the last named area in the region, but until then, which one of all the little dark spots actually hides something that you still need to unlock is anyone's guess. As an example, let's take this screenshot I took while exploring Jundland on Tatooine on my agent the other night. There are a lot of dark spots left, but I was actually only missing one explorable area at this point. Can you guess which one it is? There are some hints you can follow. For example the big triangular splotch just off the centre is out, because the hexes inside it have black lines instead of light blue ones. This is something I only noticed fairly recently, but basically the black lines denote the edges of the explorable map, like a big "nothing to see here" sign. There are also black lines around the outer edge of the area I've already explored, so it's not as if I haven't ranged far enough, even if there are seemingly large chunks of darkness out there. Ta-daa! Apparently I had missed a whole Imperial outpost there, but now that I've found it, the whole map reveals itself at once. This is useful if you're trying to uncover everything on a planet but can't remember how much you completed previously - as long as you can still see the hexes, you're not done. Finally, let me just share with you a couple of planets and sub-zones that gave me particular trouble while trying to explore them myself: maybe this will help someone else who's experiencing the same issues. Ord Mantell: The Lava Flow Overlook is the one area you'll never get sent anywhere near while levelling up through questing, and it's not immediately obvious how to get there. The "secret" is to jump up the rocks in the south-western corner of Fort Garnik. 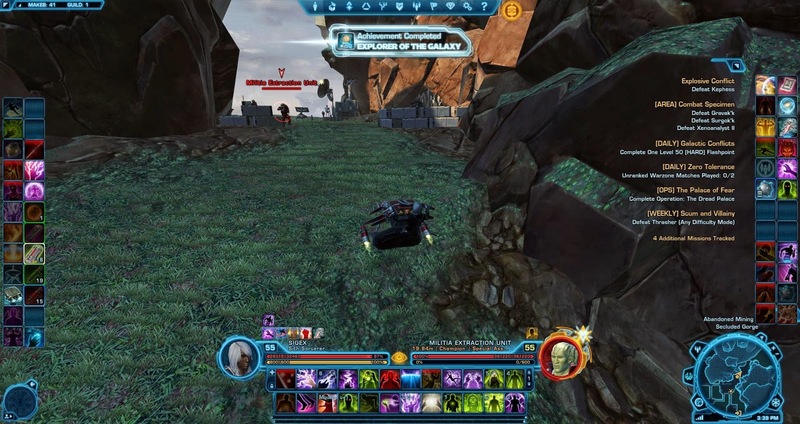 One of the henchmen during Bounty Contract Week spawns up there as well. Balmorra (both factions): In the Sundari Flatlands, I initially had some trouble to get the western edge of the map to uncover. As it turns out, those bits are actually the heroic area and the attached canyon which you access from the north-eastern corner of Gorinth Canyon, but for some reason they count towards progress for Sundari. 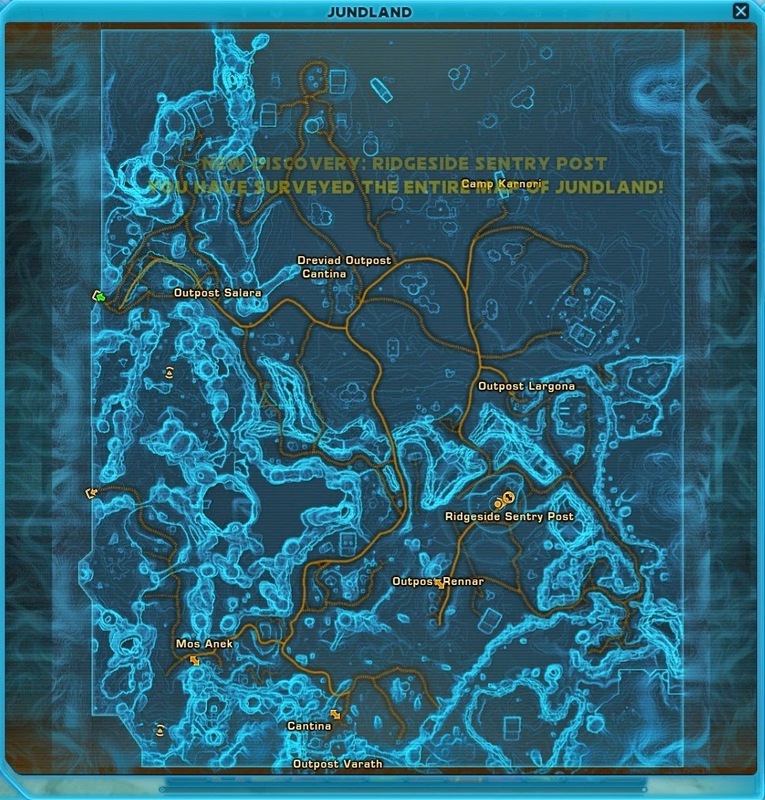 Alderaan: The Juran Mountains is one of those areas where you end up with tons of dark hexes scattered all over the map when it looks like you should've already revealed everything... yet the final sub-zone is actually somewhere completely different. As you enter the area from the south, go up the mountain path on the east, all the way to the top, where all those Rist soldiers hang out. Then, jump down the southern cliff face, where there appears to be a bit of a plateau leading down to King's Pass. It's called the Alaskan Overlook and probably the only thing you're missing. I don't think I ever would've come up with that one myself if it hadn't been for a helpful comment I found somewhere buried on the official forums. Hoth: In the Glacial Fissure, the area at the very bottom of the map, south of the heroic area, has no obvious entrance. There is however a hidden path through the giant icicles, starting at roughly X: 330, Y: 1160. Belsavis: In the High Security Section, a couple of dark hexes in the middle of the map drove me nuts. They are right where you go to the Willpower datacron, but they just wouldn't uncover! That's because they don't count as a sub-zone, and I was actually missing another area, in my case the perfectly rectangular bit underneath the southern exit towards Maximum Security. 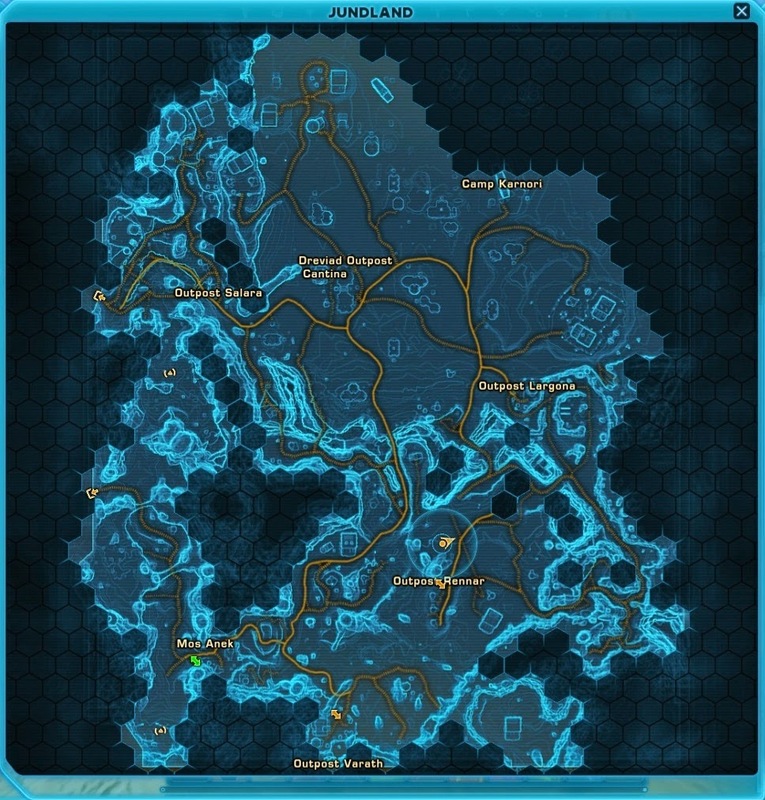 If you're on the road leading to the outpost where the Republic bonus series starts, there's a big tunnel off to the north that leads into a secluded area full of Trandoshans and Varactyls, which is where you need to go to reveal that part of the map. The Imps actually have a quest there, but as a Republic player it's easy to miss. Makeb: I didn't have any issues uncovering the map on Makeb, but even after I had found everything on my Commando and everything showed up as completed and ticked off in the achievement panel, the status of the "Explorer of Makeb" achievement remained stuck on incomplete. The forums recommended doing it on both factions to get it to pop, so I logged on my Sorcerer and finished uncovering the map from her point of view as well, which finally worked to trigger the achievement. If I remember that part of Alderaan correctly, there are two ways to get that corner of the Juran Mountains. As you describe, you can follow the path clockwise up the mountain (Pubside, the old woman just past the double bridge into that area from the Alsakan Lowlands gives you a mission to go up that path and frag the transmitter at the top), but you don't need to do any jumping; when you get to the top where the ruined building with the transmitter is, if you head to the left past the spawn of four mobs you'll go over a crestline of the hill and down into an area that unlocks that section of map, after which you can go back up the hill (and take out the transmitter). The other way is to head east from Alsakan Lowlands toward the bridge to Wardpost Luurdes, but instead of crossing the bridge you angle left around the southeast side of the mountain; there is a triangle of flat ground, at the back of which is a climbable rock slope down into the river. Enter the river and hug the east wall as you work your way north, and you'll cross back into the extreme south corner of the Juran Mountains and 'discover' that corner.